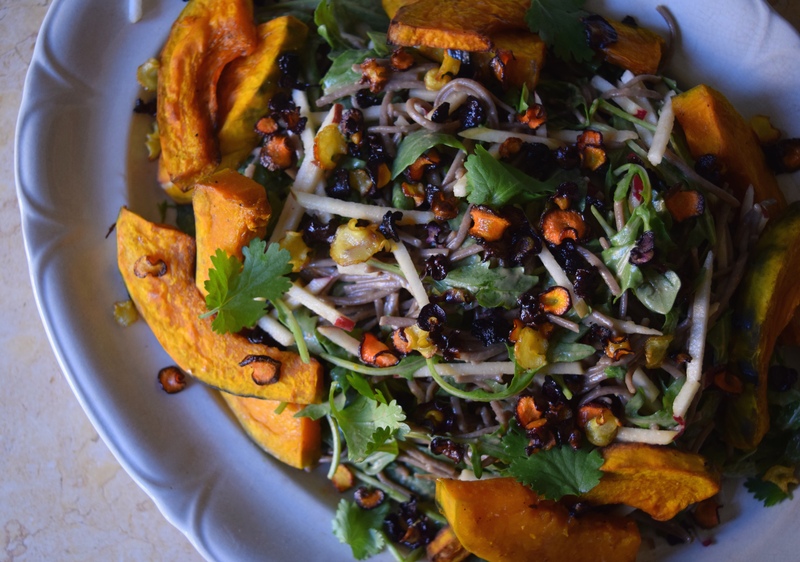 This hearty autumn salad was inspired by last week’s trip to Napa Valley. On our first day, we drove to Sonoma County and spent a lazy afternoon wandering around Healdsburg. SHED, the foodie paradise market and café, was by far our favorite spot. My friend Domonique, a San Fransisco native, mentioned that it’s probably the most instagrammed place in wine country and after seeing it for myself I understand why. SHED exemplifies Northern California culture – hyper fresh, local, sustainable, organic, simple and thoughtful. The eat-local/organic/farm-to-table movement now prevalent everywhere began in this little corner of the world, and spending time there had a profound impact on me. But back to this recipe. 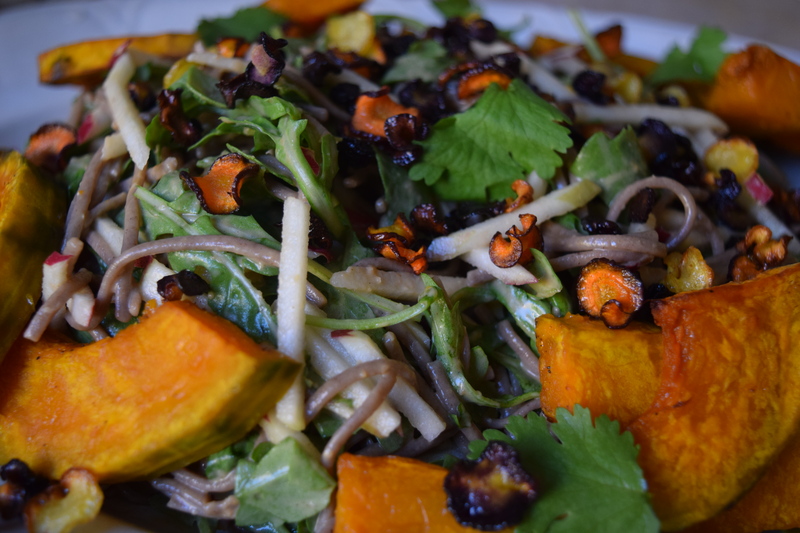 I spied a beautiful salad in one of the cases at SHED that had soba noodles and winter squash. I was too stuffed from the heirloom tomato BLT and pear tart I’d enjoyed at Barndiva to try it, but I snapped a picture and made a mental note to create one with similar ingredients at home. Having no clue as to how it was dressed, I made a creamy red miso and ginger dressing which pairs well with the rich and earthy buckwheat soba. The crispy carrot chips were my addition as well. They are sweet and salty, crunchy and addictive – a perfect salad topper or healthy snack. 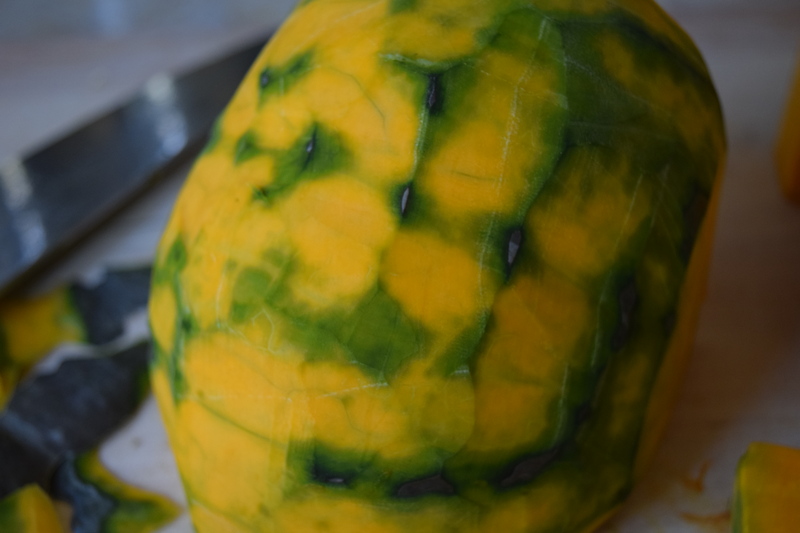 Buttercup squash is a dark green and silvery squash that sometimes has a crown appearance. 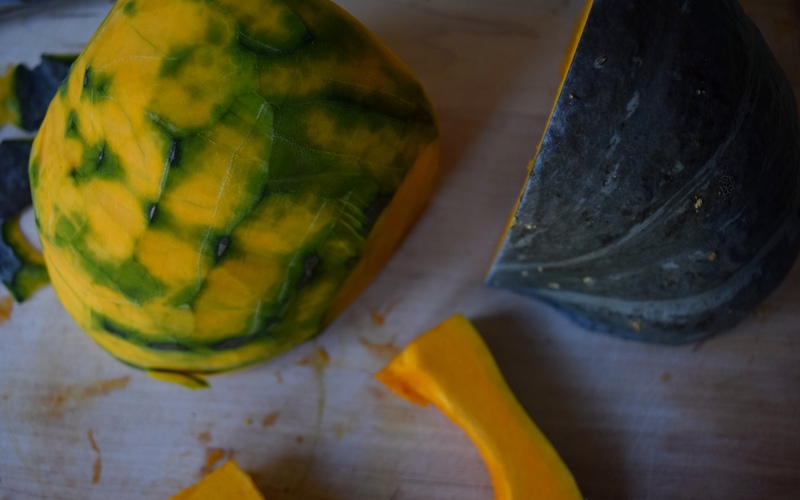 It’s creamier and more dense than other winter squash, with flavor and sweetness similar to a sweet potato. You can substitute another winter squash, butternut or acorn for example, if you can’t find it but your bake time may be a bit shorter. Preheat oven to 400 degrees. Line two large baking sheets with parchment paper. 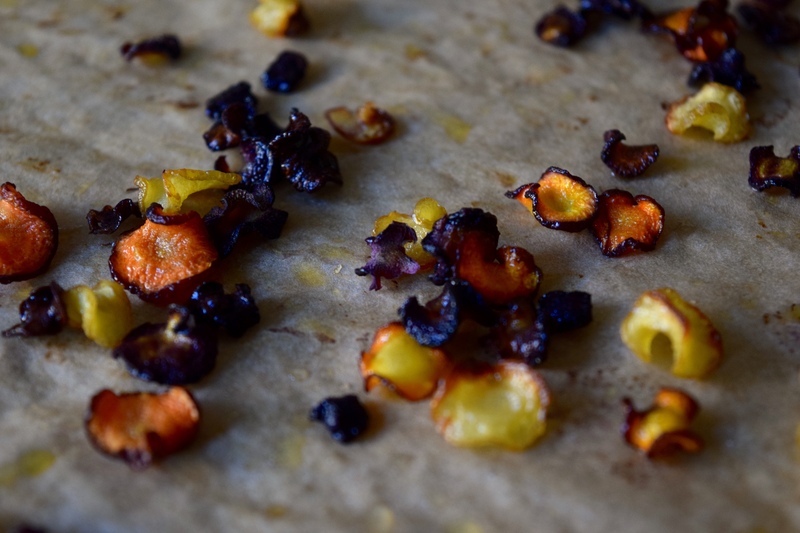 Place squash on one baking sheet and carrots on the other. Drizzle all with olive oil and season generously with kosher salt and freshly ground pepper. Toss to coat. 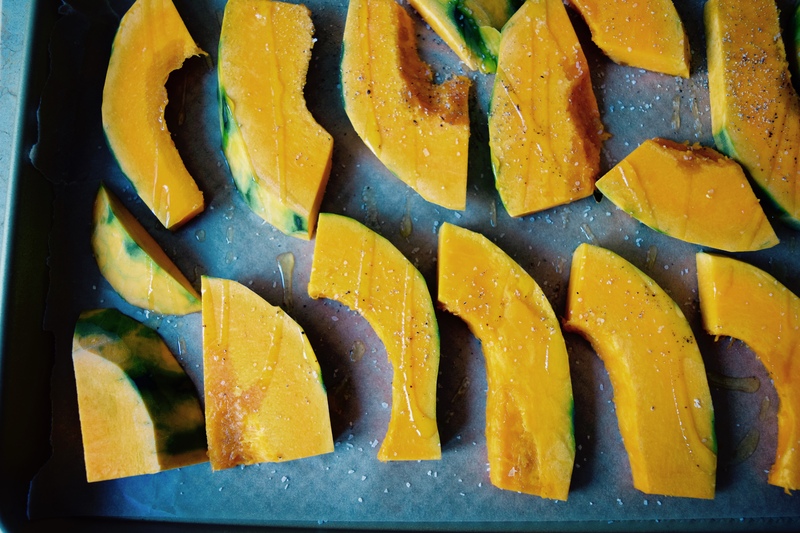 Arrange the squash in a single, even layer on sheet and bake for 25-30 minutes, flipping over once during baking time, until squash is tender and beginning to brown on the edges. Set aside to cool. 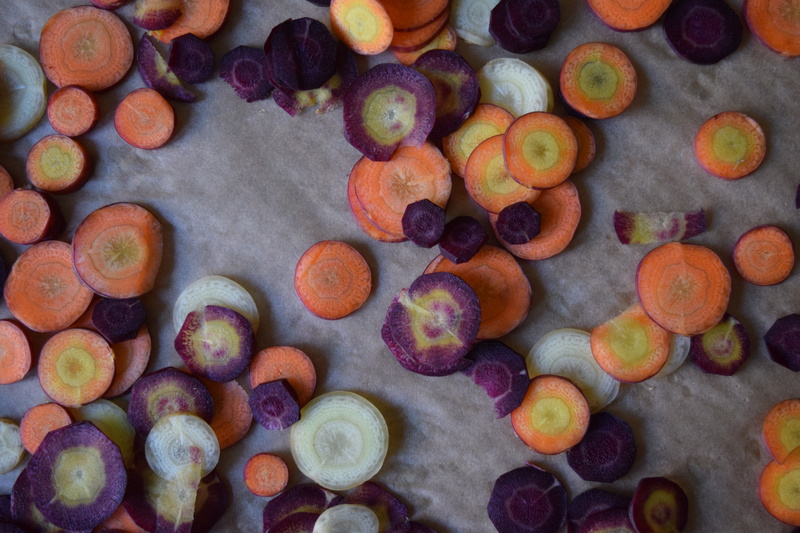 Spread carrots into a single, even layer on the other baking sheet and bake for 10-15 minutes until shrunken and crispy (the bake time varies depending on how thin your carrot slices are – begin checking frequently after 10 minutes because you want them to be crispy but they burn very quickly!). Set aside to cool. While squash and carrots are baking, bring a large pot of water to a boil. Add a tablespoon of salt and 8 ounces of soba noodles to the water. Prepare according to package instructions (keep an eye on your pot as soba noodles tend to foam up and boil over) being careful not to overcook. Drain immediately into a strainer and rinse under cold water until noodles have cooled. Place in a large bowl. Add cucumbers, apple matchsticks, arugula, chopped cilantro, and 1/2 cup of dressing to bowl with the noodles. Toss well to coat and add more if needed. Place in a serving bowl or on a platter. Add squash (a few slices for each person) and just before serving, sprinkle with the crispy carrots. Drizzle with a bit more dressing and garnish with cilantro leaves.